Medium. Suitable for all ages. Adult $50 per person. Concession/Pensioners $35 per person (on sighting of concession card). Child (5–16 years) $35 per person. Family $135 for 2 adults and 2 children. $8 per day for standard vehicles. $10 per mini bus (up to 8 seats). $15 per mini coach per day (less than 22 seats). $30 per coach per day (22-24 seats). $40 per coach per day (greater than 44 seats). Mungo Visitor Centre, Mungo National Park. Meet at 9am. Bookings required. Phone 13000 PARKS (1300 072 757) or book online. You can also book on the day at the Mungo Visitor Centre 30 minutes prior to tour. Walk with an experienced NPWS Aboriginal Discovery guide back in time on the famous Walls of China. These sites have immense cultural significance. 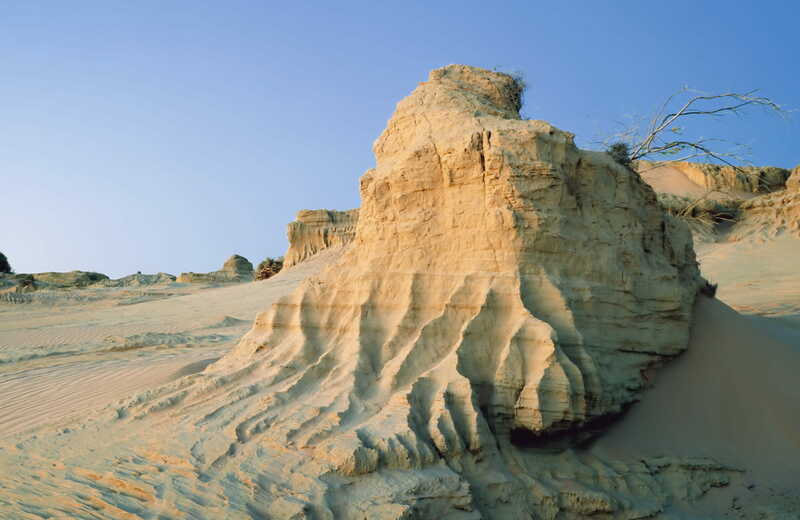 You’ll learn about the 40,000-plus years of Aboriginal cultural history of Lake Mungo and the Traditional Owners. You'll also hear about about Willandra Lakes. 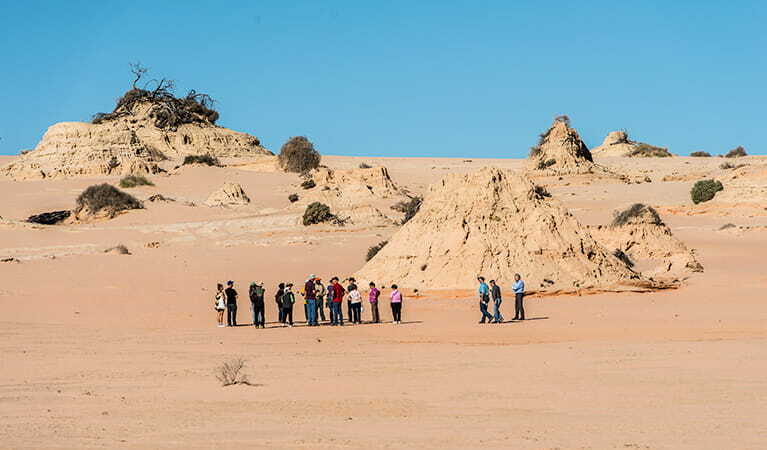 You’ll be welcomed to Country and engage in a cultural experience unique to the Mungo landscape, offered by Aboriginal NPWS guides. You’ll follow the NPWS service vehicle to the Walls of China carpark in your own vehicle. Access to the Walls of China is by guided tour only. Mungo National Park is always open but may have to close at times due to poor weather or fire danger. Park entry fees: $8 per vehicle per day. Fees are payable at Mungo Visitor Centre, or through self-registration envelopes. Different fees apply for commercial tour operators and vehicles with 8 seats or more.